Cockapoos are active dogs as they are made up of breeds bred for intelligence and hunting activities. Therefore providing both mental and physical stimulation helps keep them happy and healthy and less likely to bored, it also helps us as owners enjoy our time spent with them.Agility and Flyball are two very active and popular activities that many participate in and also many take their dogs on courses for Obedience training. But what games can you play with them or what other means can you satisfy their need for stimulation? Or maybe take it even further and look at classes for dancing. Dancing with dogs is known as canine freestyle where the dogs learns heelwork and steps in time with you and the music. Hiding food and or treats in Kongs or treat balls and cubes is another way to keep them occupied. 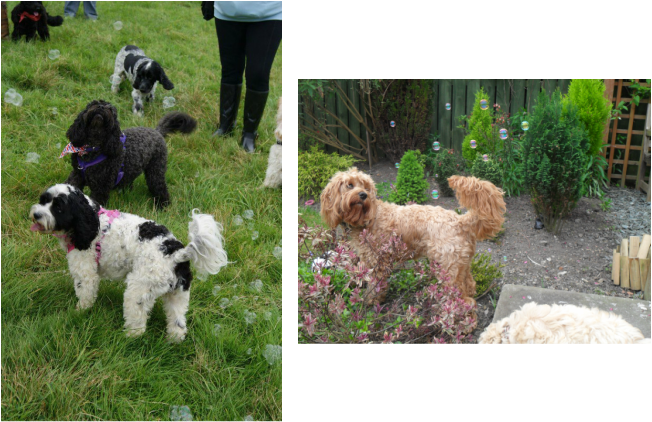 Some owners also throw kibble/treats onto the garden for the dogs to find. It means they have to work harder to get their food and also makes use of the scent retrieving skills. A good one to try in the summer is to freeze treats in ice and then let him have great fun trying to get at them. You can play games that cost very little, and some can be played indoor , ideal for those rainy days! 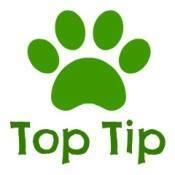 Hide the treat games : Place a treat in a rolled up towel or cloth and then the dog has to get to the treat. The idea is to make up a few of these towels and you could also go further and hide the towels around the house for the dogs to search out and find. Or you can use a tin bun tray. 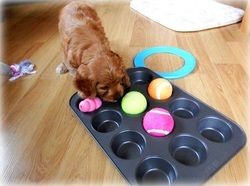 Place treats in each and cover with a ball or toy and let your dog sniff out the treat. Ballon Fun : Tether a balloon or tennis ball to a ceiling fan or the washing line, just out of reach. Your dog will have a blast trying to catch it . This may not be suitable for dogs that have a ‘never give up’ attitude as they may wear themselves out. If your dog is like this, perhaps use this game when you’ll only be gone a short time or are around to supervise their play. Sand pit : Make a sandbox filled with non-toxic sand or soil so that your dog can have a good dig and find treats and toys that you have hidden in it. Search for the treat: While your pet is watching, place a treat or a toy into one of two small boxes that differ in size, structure, or colour. Then move the boxes around and direct the dog to search for the object. At first, leave the boxes open or loosely covered; later, for dexterity training, use boxes that the dog has to open. Cardboard Puzzle Box: Fill a cardboard box with treats and scrunched up newspaper. Tape up the box with a few holes in it to allow the scent of the treats to attract your dog’s attention. Let them play and destruct the box, to find the hidden treats. Autumn Leaves : Fill a box or washing up bowl with leaves and hide treats amongst them for them to sniff out and find. Bubbles: Either use a handheld bubble makers or invest in an automatic one and watch as they chase bubbles around the garden. Swimming: Some areas have pools where you can take dogs to swim. This is another great fun activity where your dog is not only learning a skill, but it is also a great way to keep fit and healthy too. Ball bobbing: This is a great game and mentally stimulating for them too. Fill a deepish tub with water, add various size, textured balls and watch them work it out! Because the waters too deep when they bite it goes under just like apple bobbin- have a go they will love it! You can buy toys that are made to challenge the dogs mind. One example are the Nina Ottosson interactive dog toys. These are great for pushing your dogs mental ability, providing physical stimulation and to show you just how intelligent they are. All of the toys require you to hide treats within the toys for your dog to try and get out. They come in three levels of difficulty and are available as either wooden or plastic dog toys. Home made dog toys...Try putting a plastic drink bottle ( handy sized) in an old sock and tie the end. Makes a great crunchy toy..but do supervise as they can eventually tear the plastic. Or place a ball in an old sock, pair of tights and knott the end. Janet one of our club members decided to make some Tuggies toys for her dogs and some of her cockapoo friends. 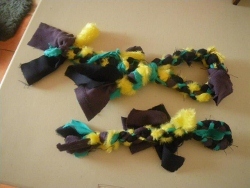 These are made with strips of fabrics tightly plaited together. Of course a willing husband helped out by donating fleeces to be cut up, which has now sparked interest in our other members who are rifling through their husbands wardrobes as I type!!! Snuffle Mats : A fabric mat that you can hide treats in for your cockapoo to have a good old forage about . You can buy these ready made or make one yourself. You can buy kits from ebay or quite simply use a shower mat with holes, or some sink drainer mats, which are cheap to buy, and a couple of polar fleece blankets ( Primark and B&M's do them cheaply) cut into strips, thread each strip through each hole then tie in knot to keep secure. Have fun with different coloured strips. The flirt pole is the perfect way to provide exercise for your dog and work on impulse control exercises at the same time.